A compact 13.3 inch notebook, combined with a high performance graphic card of the type ATI Mobility Radeon HD 3870 – Impossible, you think? False. With the Graphic Booster, FSC launches as one of the first manufacturers an external graphic card for notebooks, which can flare up an external screen when necessary, transforming your mobile office to a gaming device. It's already been a while since Asus announced for the first time to offer an external graphic solution for notebooks with its XG station. The concept sounded appealing, if it helps this already very mobile and compact notebook to sufficient performance for gaming use when needed. The initial hype quieted down quickly, though, with information turning up by and by which certified the XG station as having only extremely restricted performance reserves. 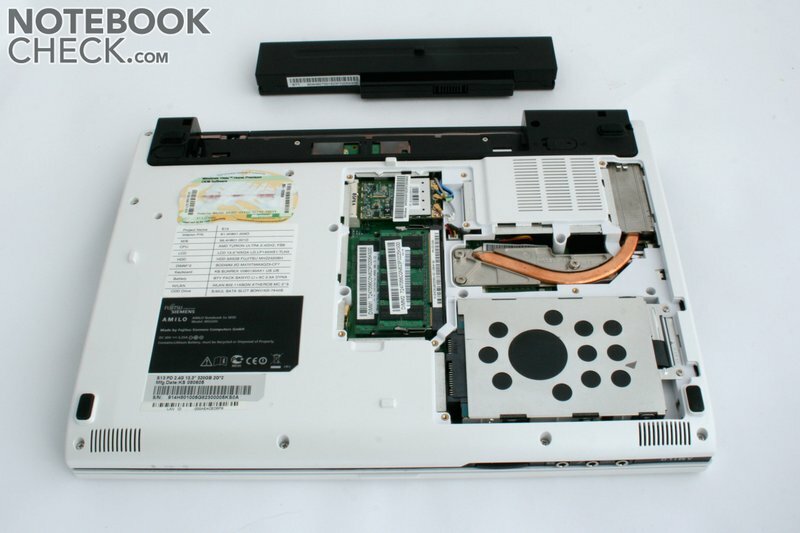 The bottleneck was primarily the connection of the XG station via the PCI-Express x1 port to the respective notebook which bandwidth lay only at a fraction of the system integrated graphic cards. Finally the GeForce 7900GS graphic card went out of fashion and was replaced with a GeForce 8600 GT from nVidia. But the re-named Asus ROG XG Station is not really available. Looking at the ardent media interest, the obvious failure of the XG station at least can't be due to the concept. It was rather more due to technical problems which could not be solved contemporarily. Fujitsu-Siemens Computers (FSC) is taking a new try and face up to the same problem. While the basic idea stayed the same, another significant point changed since the beginnings of the XG Station from Asus: the technique. In melting the AMD processor manufacturer and the graphic card expert ATI, an interesting conglomerate with the know-how of both up till now strictly separated sectors, innovative developments are made possible. The first result of this "jumbo merger", for instance, is the Puma platform from AMD. 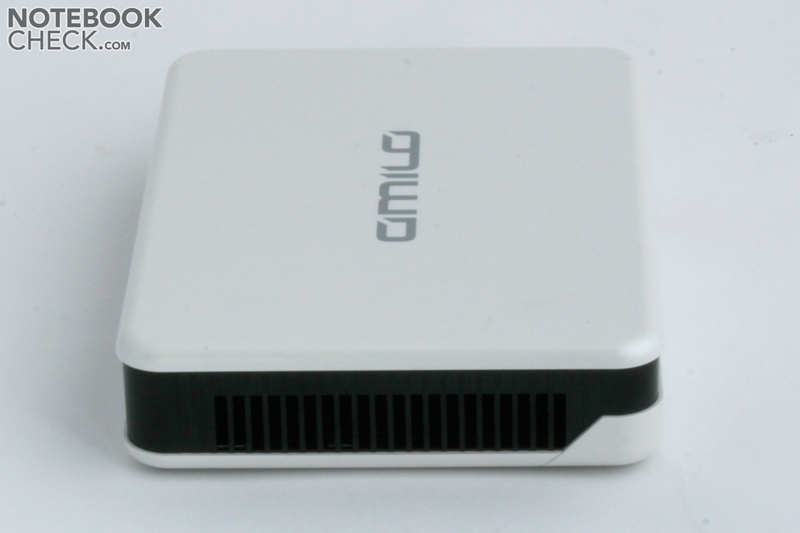 Amongst other things this offers a XGP graphic solution (eXternal Graphics Platform), which allows connecting an external graphic card to a system over its own port, which subsequently takes over the graphic tasks of the built in graphic chip. Because the external graphic cards have their own cooling as well as their own power supply, opening a whole range of interesting possibilities following the same principle as "6.0l V8 greets Opel Corsa…" More of this under the heading "Performance" in the following test. The technical aspect regarding the Graphic Booster from FSC provides of course, for ample writing material in this test. Without the appropriate notebook this would be too, without any use. 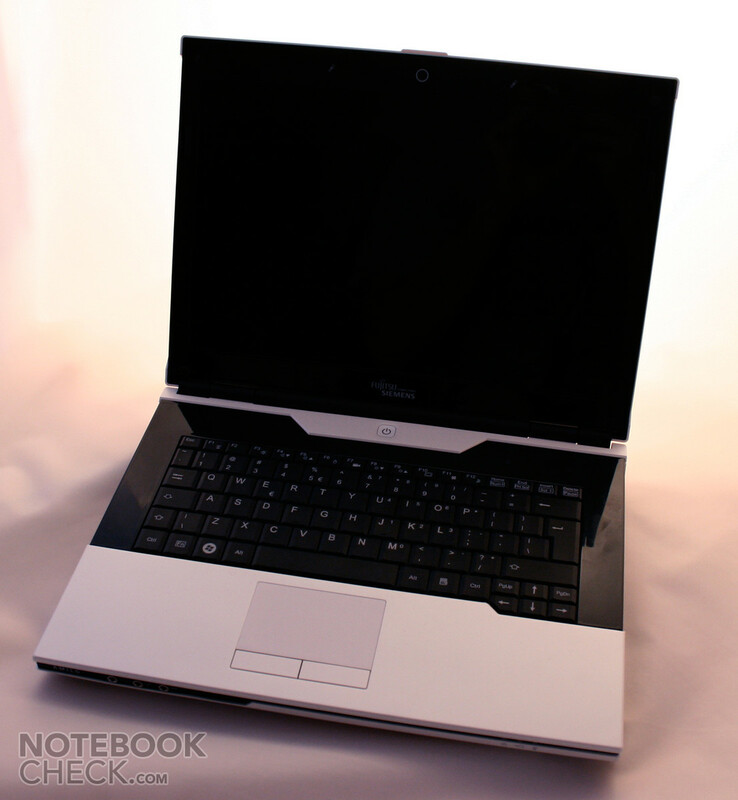 In combination with the Booster, or if desired without it, FSC offers the Amilo SA3650 notebook, a compact 13.3 inch multimedia notebook in the current Amilo design. The current Amilo design means a harsh black-white contrast and just as evenly harsh geometric contours with stern 45° angles and an all-over appearance, which reminds of those, in the meantime gotten on in years, various control consoles and space stations of science fiction productions. At any rate, with the team from Ideo, a renowned designer studio, occupied them with the design of the device and granted this at least a strong recognition factor, even if I could certainly start a discussion over liking or not liking of the new optic. While the compact appearance of the notebook also has to be ascribed to the responsible creative heads, their influence does decrease at the used materials considerably. Constructive planning and last but not least financial aspects play an important role here. That is the only explanation we have for partly very sloppy workmanship of the case of the Amilo SA3650 from FSC. Following the single detailed points of criticism. There's no question, at first sight the Amilo SA3650 seems to be solid and barely arouses any negative feelings. However, at intensive mobile use little by little a few weak points became obvious in the test. Especially on the plastic cover of the upper side of the base unit. Our test device let itself be lifted considerably and without much restraint in the front edge area of the touchpad from the rest of the device. With slightly more "strength", in this case using a fingernail, we achieved this on the back edge in the area of the hinges, too. Of much more weighty importance in the possible consequences, though, is the partially suspicious low pressure resistance of the base unit. This gives away already at light pressure particularly on the bottom side and in the area of the extension slot or the slot-in DVD drive. That particularly in compact notebooks the connections are rationalized with pleasure, apparently impressed the makers of the SA3650 cordially little. They planted into the small multimedia-pro two USB 2.0 ports, a combined USB eSATA port over which a high performance connection to an external hard disk can be linked, a DVI-I port (incl. HDCP) for the connection of an external monitor with a good image quality as well as the indicated XGP port for the Graphic Booster from FSC. 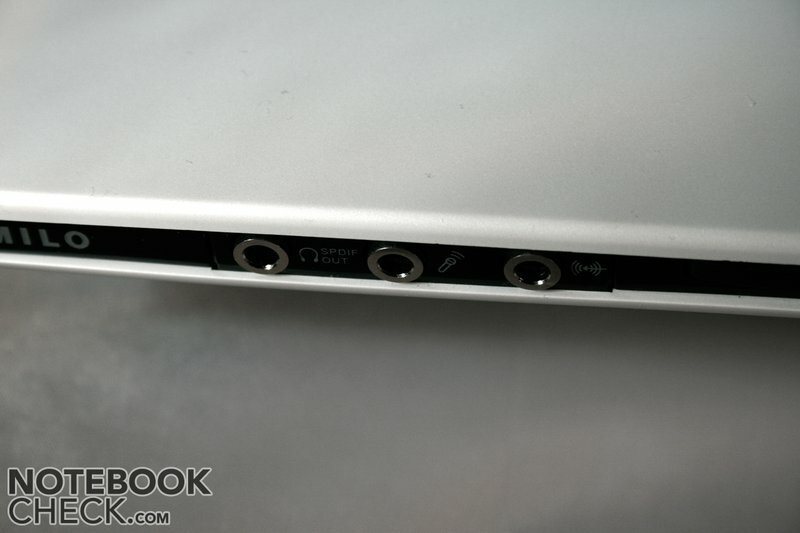 A Firewire port, the LAN connection and the audio ports (line-in, micro, line-out – S/PDIF) on the front side of the laptop round up the package. On the whole, therefore, it has been equipped extremely generously for a notebook of this category. The position of the single ports turned out absolutely positive in course of the test. 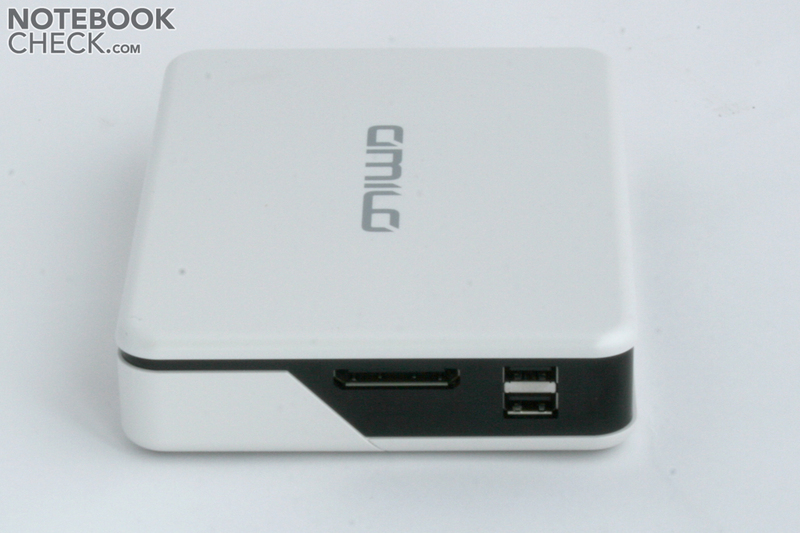 Especially the distribution of the three USB ports on the left and right side, as well as on the back side of the device was able to convince. The S/PDIF out on the front side of the notebook might not be optimally placed for permanent use. 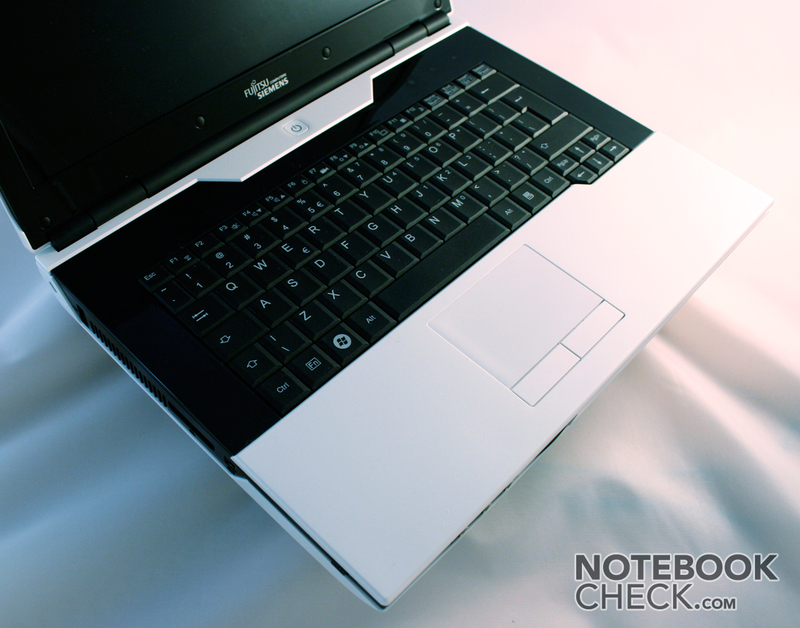 Lefties as well as righties shouldn't have any problems with the notebook, other than one uses the notebook with the Graphic Booster which is connected in the middle area of the left side. In this case the notebook will probably be pushed aside anyway because the video display runs over an external monitor and one probably will prefer to use an external and definitely more generously sized keyboard. The communication equipment of the FSC SA3650 contains a Gigabit LAN (10/100/1000) network connection from Realtek as well as a wireless LAN module of the type Atheros AR5008X (WLAN b/g/n, up to 300 Mbit/s) belongs among other items. 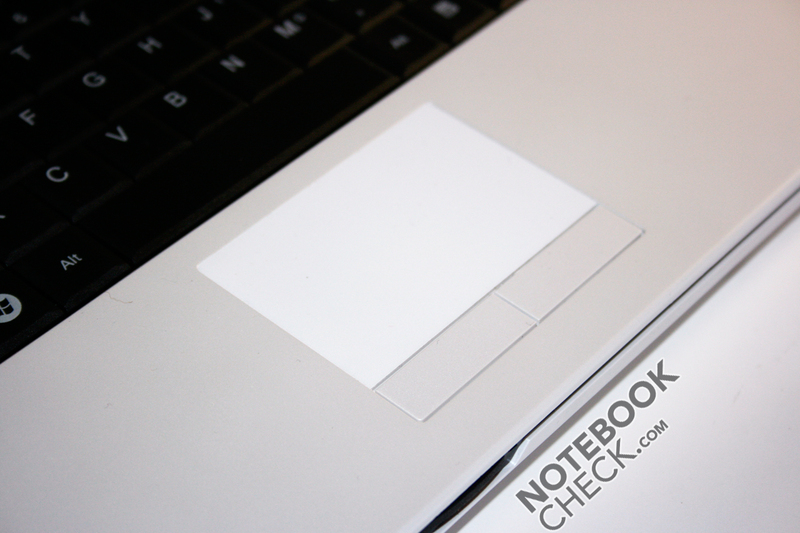 A Bluetooth 2.1 counts itself to the standard equipment of the notebook, too. The WLAN had to be reactivated after every reboot in the course of our test which is a very unusual idiosyncrasy which became quite annoying after a time. A further feature of the FSC3650 is the built in webcam (1.3 Megapixels) from Logitech. This offers, with a resolution of up to 640x480 pixels, an extremely good picture. All resolution settings above that are extremely over-focused and don't show a better image. At poor lighting conditions the image repetition rate decreases enormously due to the image improving algorithms (brightening, anti-flickering), the image quality stays – in comparison – surprisingly good. The 32-bit version of Windows Vista Home Premium is used as the operating system. When considering an upgrade of the RAM, this could prove to be a stumbling block under circumstances, because the 32-bit OS (operating system) only supports up to a maximum of 3 gigabyte of memory. By a higher memory need, the operating system would also have to be upgraded to a 64-bit version. Regarding the guarantee FSC offers a 24 month "Collect and Return" service, that means in case of liability the device will be picked up from you and be returned after the necessary repairs. The keyboard is basically very pleasant to use but doesn't really sit very tight in the faceplate. A clattering wasn't noticed during typing on the keyboard in the test, though. The layout of the keyboard can also be described as exceptionally good. Even though we had a device with an American layout in the test, touch typing wasn't any problem at all. The keyboard unit is also splashing resistant in which FSC indicates a tolerance of 50 cc, which should suffice as a rule for everyday dangers in form of various beverages (one shouldn't really poor a whole glass, being approx. 250ccm, over the Amilo, though…). 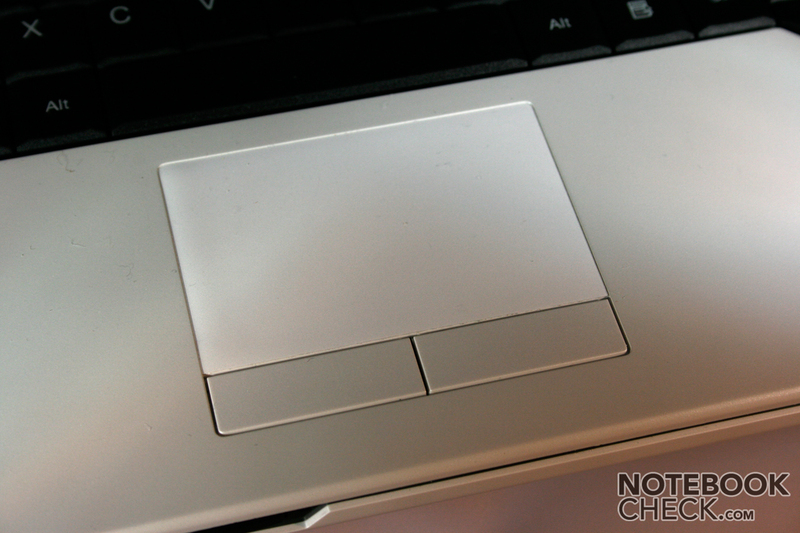 The touchpad is sized sufficiently and offers pleasant gliding properties. An additional, optically marked zone for scrolling isn't provided, though. Criticism goes to the stiff touchpad keys, as well, leaving a generally cheap impression and present themselves as very unpleasant to use. Primarily, the high press-resistance counts to this, making "drag and drop" with the left mouse key very difficult. The central power switch over the keyboard, which was partly just as difficult to use, suffered under the same diagnose. 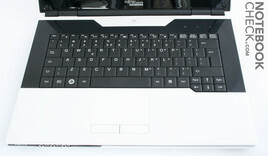 Above that, three touch keys were placed by Fujitsu over the keyboard on the right. They can be used to reduce the CPU to 600 MHz and is draped under the well-sounding concept "Silent Mode", for the start of Mediaplayer and to throw an inserted DVD out of the slot-in drive. In the test these worked quite well. 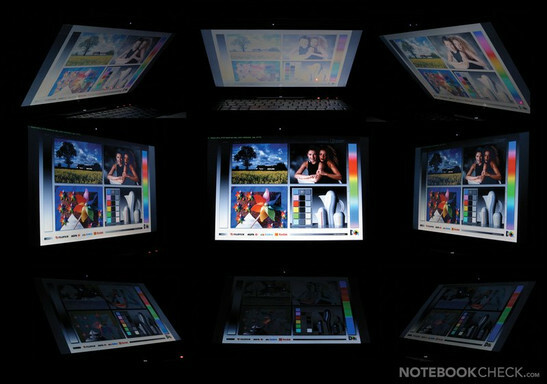 The notebook roughly joins, according to performance, the level of netbooks in Silent Mode and aptly the possible range of use of the device in this state. The used display in the Amilo SA3650 is a 13.3 inch LCD screen with a resolution of 1280x1280 pixels and BrilliantView technology, meaning a glossy display surface. 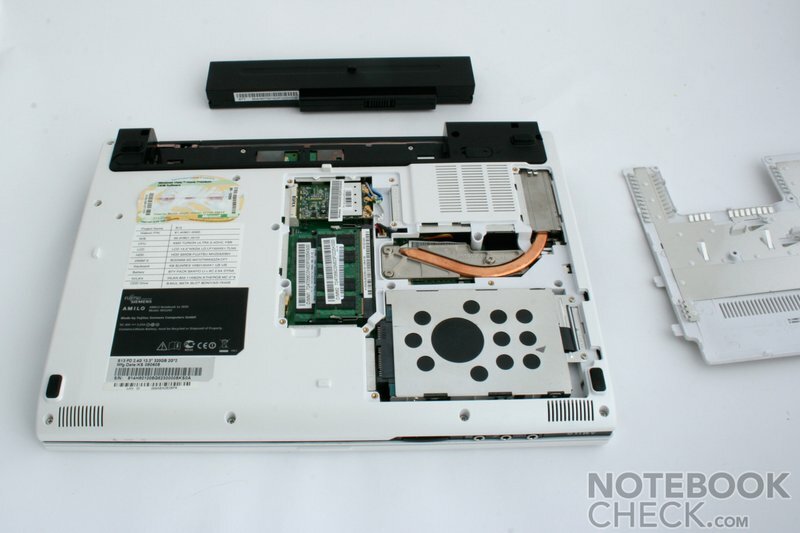 Due to this the laptop doesn't exactly brim over with working surface, but generally the offered overview has to be called sufficient for basic tasks. In the context of our measurements the built in screen offered a maximum brightness of 220 cd/m2 in the central display area. In battery mode this value was reduced to 204 cd/m2, despite maximal brightness settings. With a very immense brightness reduction in the left corner areas of down to 155.4 cd/m2 the Amilo SA3650 achieved a value of merely 70.6% in the display illumination. Therefore the FSC lies according to the manufacturer's specification of 200 NIT in our measurements very good. Incomprehensible is the maximum contrast of 400:1, though. With a measured black value of a relative high 1.72 cd/m2 the notebook reached a maximal ratio of merely 128:1 according to our results. Subjectively, the displayed white seemed to us as too impure and the light could be seen even with a black display background. The image display itself couldn't really convince us because of a somewhat stepped grey gradient and very pale skin tones. Outdoor use proves to be somewhat difficult due to that. Even though the maximum brightness in battery mode is approx. 200cd/m2, because of the rather low contrast and the uneven illumination as well as the reflective display surface, it comes in especially bright surroundings to an only difficult to read image. Finally, the screen of the FSC Amilo SA3650 doesn't achieve the best grades concerning the allowed viewing angle, either. Quite the contrary, in the vertical range it comes very quickly, at an alteration of approx. 20% of the "ideal" vertical viewing angle, to considerable images transformations. However, these tolerance ranges turn out a bit more generous in the horizontal area, occurring reflections provide for an impairment of image viewing rather soon, too. The Puma platform from AMD builds the technical basis of the Amilo SA3650 from Fujitsu-Siemens. This is a specific chip set which Intel comparatively calls "Montevina" or "Santa Rosa". Even if AMD sets on two core processors in the Puma range, the accompanying chip set offers a number of different features in the current Intel range. An important point in these external graphic solutions likes to be overseen: In this case, the image display can only run over an external monitor, which is connected, in the case of the FSC Graphic Booster over a DVI-I or also over a HDMI port, to the external graphic card. The notebook monitor can still be used but 3D graphics are only possible on an external display. Alltogether the XPG system supports up to 4 monitors (internal and 3 external). Besides extending the mobile system with a high performance graphic card, the use of two graphic cards in a Crossfire combination (compare SLI from the manufacturer nVidia) with XGP is theoretically possible. This variation is of interest, for instance, with two high performance systems which can be extended by a second efficient graphic card when needed and getting, with that, an additional performance push in stationary use. Interesting for instance in gaming devices. But in the case of the 13.3" notebook not possible. Only models from AMD use a processor out of the Puma range, which can prove to be a small disadvantage because its performance lies considerably behind that of the equally clocked Centrino 2 two core processors from Intel and is only comparable with Pentium Dual-Core models. The available palette of the AMD X2 processor ranges up to the Turion X2 Ultra CPU with 2.4 GHz and 2048MB L2 cache, with which our test device was equipped with. This chip only ranks itself in the area of the T8100 Penryn CPU from Intel in our comparison of mobile notebook Processors. The current Intel High End CPU range only starts here, so to say, in regard of performance, whereas the Puma range comes to its limits at the moment here. 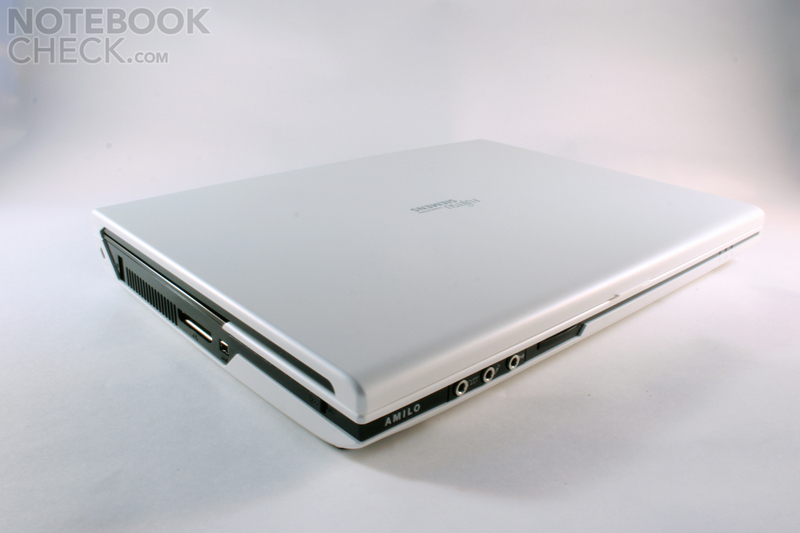 The Amilo SA3650 also has an ATI Radeon HD 3200 graphic chip as an integrated graphic card. Technically, the performance is to be put at about the same level as that of a GeForce 8400M G/GS or an ATI Radeon HD 3450. With that the chip offers considerably more performance as a standard built in graphic solution from Intel (GMA 4500M HD), but comes quickly to its limits in 3D computing. In the whole it is an excellent correlate for the Graphic Booster from FSC. And how does the notebook with the equipment at hand cut off in various benchmarks or what does the Graphic Booster supply in regards to gaming? It should be clear that we sent the FSC Amilo SA3650 through the standard test course with the well-known 3D and PC Mark benchmark tests. In these, the first problems were noticed already. For instance, the 3DMark 03, 05 and 06 rejected starting over the built in Radeon HD3200 graphic card. The 3D Mark Vantage even stopped after an error message – too bad. With the Amilo Graphic Booster the Amilo SA3650 gave an extremely respectable demonstration in the 3D benchmark tests. In the 3D Mark 2006 Test the Amilo SA3650 achieved with the Graphic Booster a proud 8064 points and can move into the supreme first league of gaming with that. The 13.3 inch notebook lies with this result slightly in front of the Toshiba Qosmio X300 gaming notebook with a GeForce 9700 GTS graphic. The result of the Graphic Booster with the ATI Radeon HD3870 graphic can only be flattened by the two top graphic cards from nVidia, the GeForce 9800 GT and the 9800 GTX. Without the activated Graphic Booster the Amilo SA3650 achieved in the PC Mark 2005 benchmark test a value of 4251 points, a rather moderate result. This can be improved slightly with the activated Graphic Booster because even in the PC Mark the graphic weight is not to be sneezed at, but generally one can only await a small performance push from the graphic card at standard office tasks. Particularly the Cinebench R10 benchmark test reveals much about the performance ability of the CPU. The comparatively low efficiency of the AMD X2 ZM 86 CPU also becomes visible here. In the single and multi CPU rendering test the processor from AMD merely reached the level of a Intel T7300 CPU with 2.0 GHz. The current Penryn Core T8100 with 2.1 GHz already delivers better results. The 3290 points in the OpenGL Shading test, with which the FSC Amilo SA3650 with the Graphic Booster can push itself on about the same level as a Quadro FX370M graphic card, can let themselves be seen. Nevertheless, a certified graphic card of the type FireGL or out of the Quadro FX range from nVidia is to be advised for professional 3D visualization and CAD tasks. As already mentioned the Fujitsu-Siemens is basically fitted with a 2 gigabyte memory. Applied is a module of 2048MB of the type DDR2 PC6400. FSC implies the maximum possible RAM extension being 4 gigabytes, whereas the Turion X2 CPU only supports DDR2 modules because of the integrated memory control. As to the hard disk FSC offers two different equipping possibilities for the Amilo SA3650. 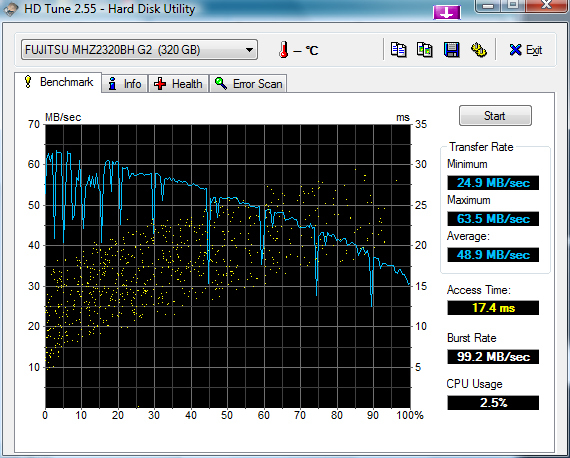 On the one hand a 250 GB hard disk with 5400 rpm and on the other a slightly bigger 320GB model with the same velocity. The built in hard disk with 320 GB gross capacity in our test device also comes from FSC (MHZ2320BH). In the HDTune benchmark test this showed a passable, average transmission rate of 48.9 MB/sec and with an access time of 17.4 milliseconds, it brought an acceptable result in this exercise. That the chances aren't big getting the best performance at gaming with the ATI Radeon 3200HD graphic integrated in the notebook already can be guessed for, considering at the conducted 3D Mark benchmark tests. This discipline is definitely assigned to the Amilo Graphic Booster which provides an efficient graphic chip with the ATI Mobility Radeon 3870HD graphic card. The performance reserves of this graphic solution already become obvious when playing, in the meantime gotten in on years, game classics like Doom 3 or Fear. The Amilo SA3650 reached in the Timedemo benchmark test set at minimal graphic details approx. 70.2 frames per second. This was but only 31.5 fps at extreme graphic settings, therefore making the game unplayable. The Graphic Booster had absolutely no problems with the OpenGL game, in compare. It delivered at minimum details 125.7 fps and with 117.1 frames per second stayed even at extreme graphic settings only slightly below this value. The performance bonus was just as obvious in the FEAR performance test. While the Radeon 3200 graphic set at high details goes WO at an average of 2 fps, the Graphic Booster delivers a still very playable 37-38 frames per second. In the practical gaming test (1024x768, high settings) in a skirmish game on a 20x20 map with 4 AIx computer opponents in an every man for himself game a very well playable performance could absolutely be observed at first. In the further course of the game stuttering increased, though, that couldn't be brought under control by reducing the graphic level. Therefore, it can be assumed that because of the increasing unit numbers in the course of the game and the increasing CPU load accompanying that, the built in Turion X2 CPU finds its limits of performance abilities and becomes a limiting factor. 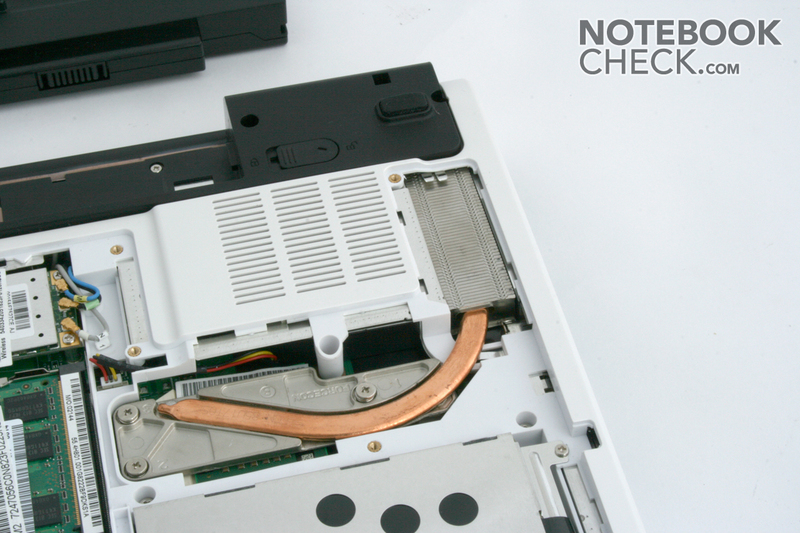 The built in system fan of the notebook blows warm air permanently out from the inside of the case even when not under load. Its running noise, however, can be described as noticeably audible but not further disturbing. The sound level measurement at a distance of 15 centimeters from the device produced a value of 36.2 dB(A) – not very quiet. The velocity of the fan is reduced in the Silent Mode but it remains, as before, very perceptible. Furthermore, one must accept a drastically reduced CPU performance of a mere 600 MHz in this case. The fan integrated in the Amilo Graphic Booster stays extremely discreet in the background without load and depending on the placement of the case is barely audible. Only when under full load it increased its speed to a considerably audible level in the test. Principally, the Graphic Booster is subjectively, however, scarcely perceived as louder than the notebook itself. The measurement showed a value of approx. 44 dB(A) under load. The perfectly acceptable idea of simply depositing the Graphic Booster a bit further away from the user fails because of the relatively short PCI-E connection cable. It is possible, in any case, to place the Graphic Booster, for instance, behind the notebook or behind another object and therefore further muffling the perceptive noise. The observed intersystem temperatures of the notebook reached up to 90°C at the CPU but stayed under 80°C most of the time. Despite these comparatively high temperatures the fan should be adequately sized because the CPU didn't clock itself down even under constant full load. Very many reserves weren't left, though. 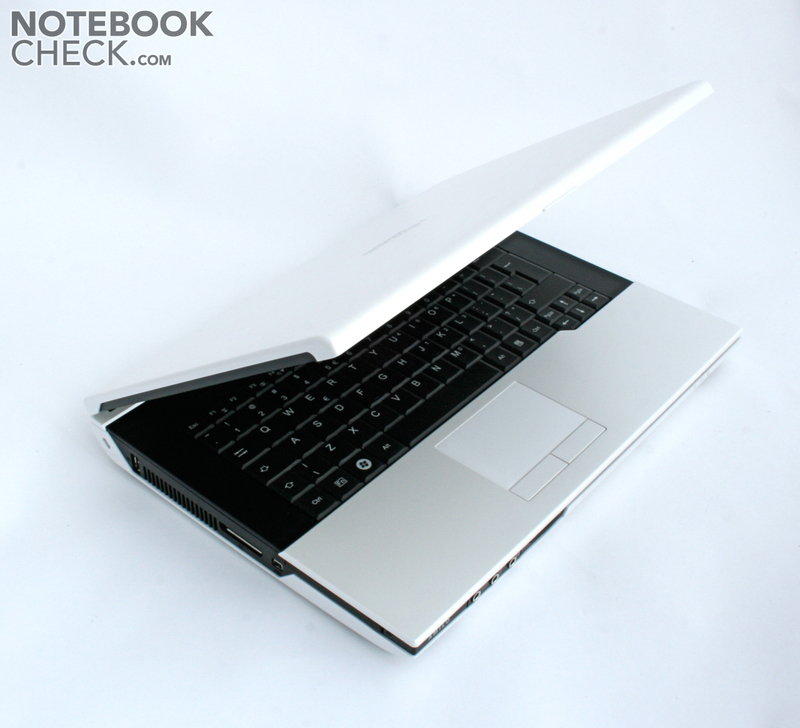 The GPU of the notebook reached maximum temperatures of up to 65°C in the test. The temperatures of the Graphic Booster always stayed within a frame even during lengthier gaming tests. For the case of the Amilo SA3650 this means a maximum warming up to 36.3°C on the surface in the left area of the keyboard. The bottom side of the notebook heated up with up to 42.6°C even more. For mobile use this means that one has to count with partly unpleasant temperatures on the lap which also could be noted at comparatively minor load, e.g. during surfing over WLAN. According to the manufacturer, the FSC Amilo SA3650 is delivered with an option of a 6 cell battery or a 9 cell battery. Our test sample showed a battery pack, with a capacity of 5200 mAh at 11.1V, secluding evenly with the back edge of the notebook. 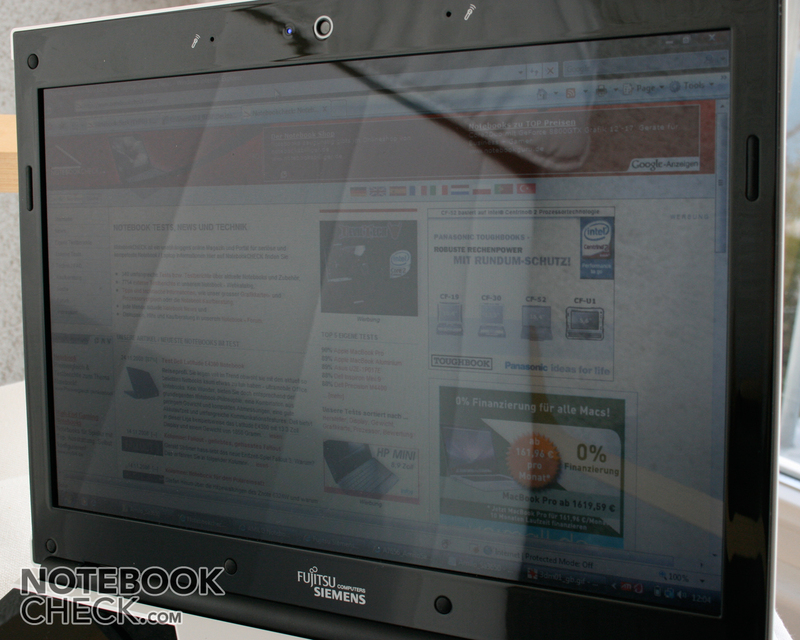 With this the notebook achieved a maximal runtime of 223 minutes in the BatteryEater Readers test (Minimum display brightness, energy saving mode, WLAN + BT disabled). With that the Amilo SA3650 doesn't exactly belong to the long distance runners. Perhaps using the optional 9 cell battery available can improve the measured result a bit. In the test it was also noticed that the system in battery mode, even at maximum settings, didn't achieve the same performance as when using the main operation mode. A down clocking of the CPU couldn't be observed though. 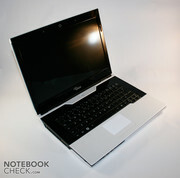 The fastest 13.3 inch notebook currently available. 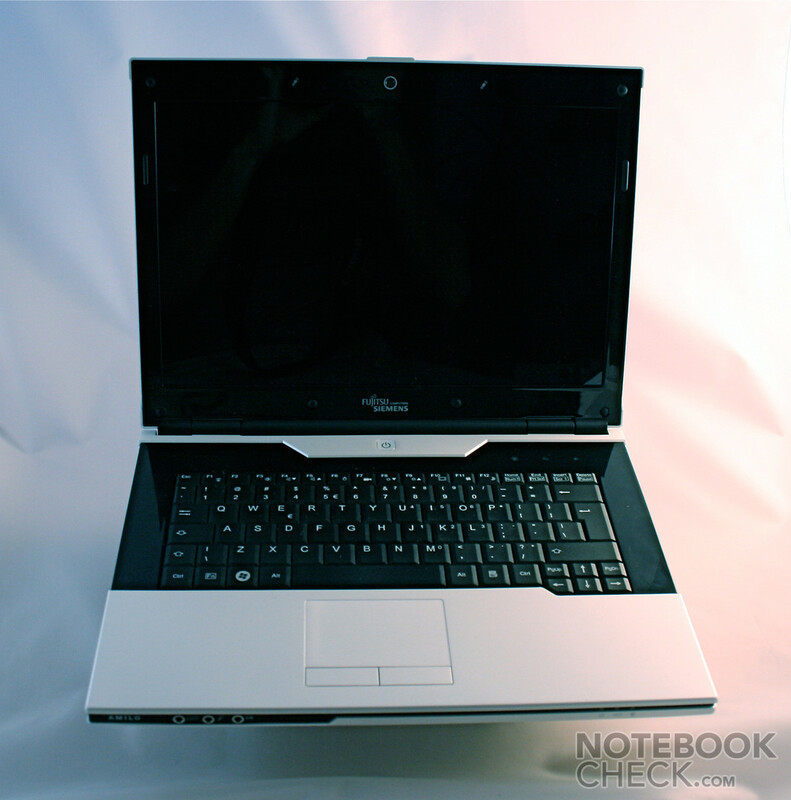 This is certainly the basic statement of the preceding test of the FSC Amio SA3650 notebook. The notebook itself is only to a small extent responsible for the immense power thrust. This is primarily due to the external Amilo Graphic Booster which provides the average equipped notebook with a high performance graphic card of the type ATI Mobility Radeon 3870HD. The results can let themselves be seen. With the Graphic Booster the compact Amilo 3650 reaches those benchmark results that are usually only seen in pedigreed gaming notebooks. The CPU from AMD proved to be a bottleneck, though, being clearly inferior to its current Intel competitors. Due to the fact that the system is based on the AMD platform, only the AMD Turion X2 processors come in question for use in the Amilo SA3650. Without the external graphic, the Amilo SA3650 presents itself as a mobile notebook with the one or the other weak point. For instance, in the workmanship or in the stability of the case, which was shown particularly in a too low resistance at selective pressure. A further point of criticism, too, is that the touchpad keys can only be pressed with a disproportionately immense resistance. Drag & Drop is made almost impossible with that. The display doesn't really belong to the exhibitional features of the Amilo SA3650. The screen offers, with approx. 220 cd/m2, an excellent maximum brightness but can't really convince in terms of illumination and contrast, though. Nor does the reflective display really contribute to a better image in mobile use, either. The emissions in use under load stay within a frame. At minor load, e.g. simple office tasks and WLAN use it has to be referred to the always audible running fan. 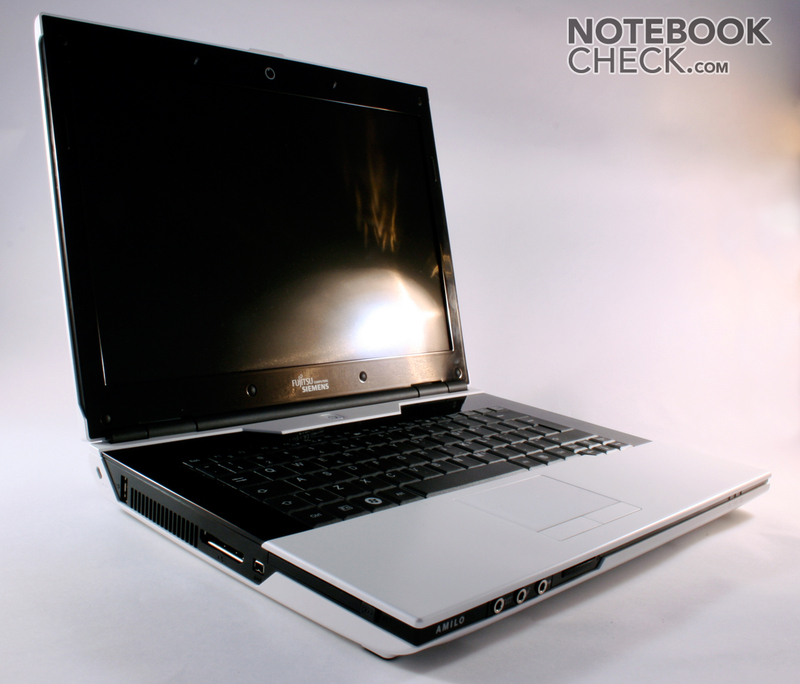 The possible battery runtime allows a mobile use of the Amilo SA3650, however it definitely still could be better for a compact 13.3 inch notebook. 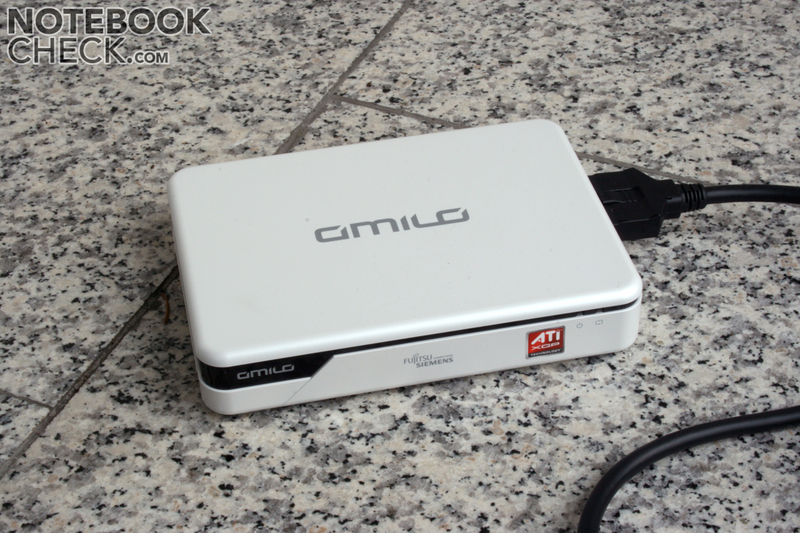 For the most part the external graphic solution in form of the Amilo Graphic Booster could convince. Thanks to it, every compatible notebook turns into a gaming machine continuing to keep all the key benefits of a compact, mobile laptop. Let's hope that FSC produces further models in connection with the Amilo Graphic Booster or other manufacturers offer compatible ones. 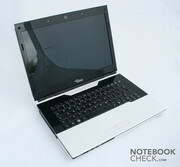 A retail price of about 1300.00 Euros for the notebook and the Booster is a proud price; nevertheless one attains unprecedented fusion of performance and mobility. Rating the Amilo SA3650 notebook turns out to be quite complicated. 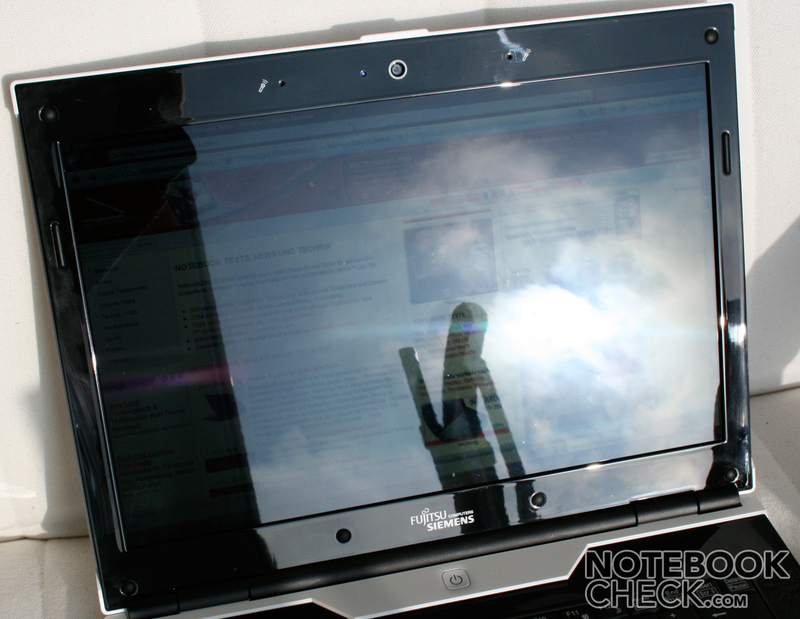 On the one hand, the 13.3 inch device shows itself considerable weaknesses for its category as a subnotebook which presses the rating. On the other, the Graphic Booster makes a performance close to DTR possible in gaming. Depending on the classification, the SA3650 achieves between 80 and 82%. In addition, there is a special award for the Graphic Booster, seeing that FSC has at last successfully created that what other manufacturers found a hard nut to crack. That there is a very interesting technology in the notebook can't really be seen at first sight of the FSC Amilo SA3650. 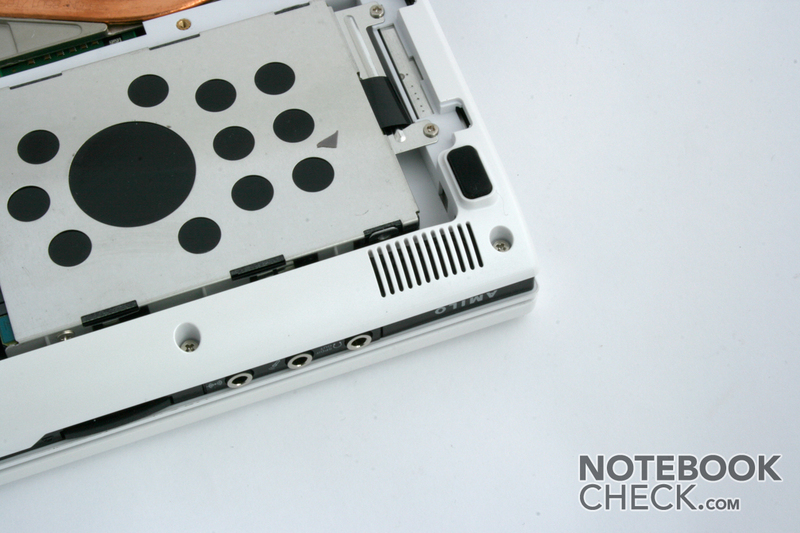 The on/off button of the notebook was embedded elegantly, even if its usage needed some customization. 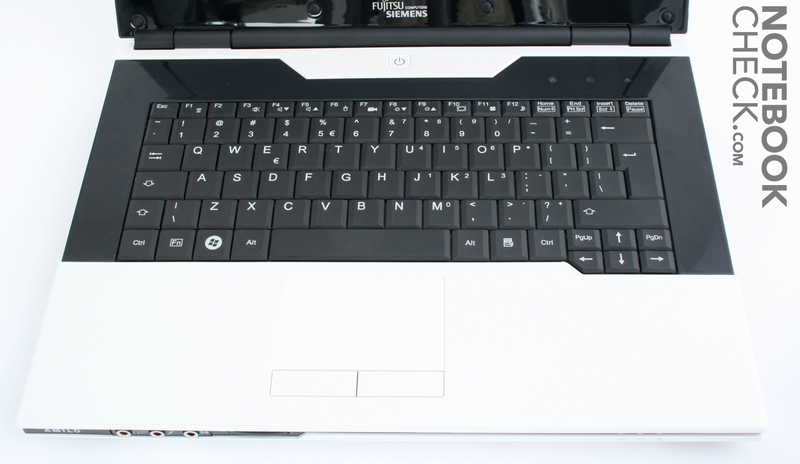 The touchpad reaped a good amount of critic primarly due to the stiff touchpad keys. 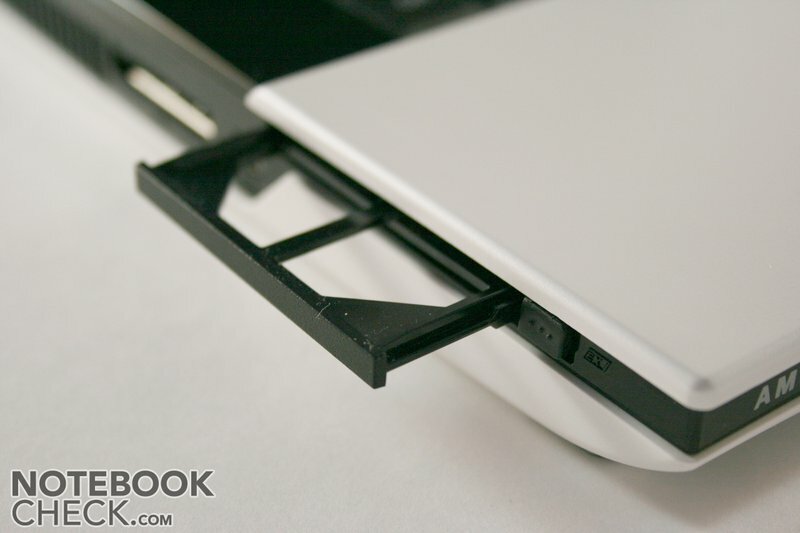 Additional extensions for the notebook are possible over the ExpressCard slot. The integrated webcam from Logitech recieved a good grade from us. 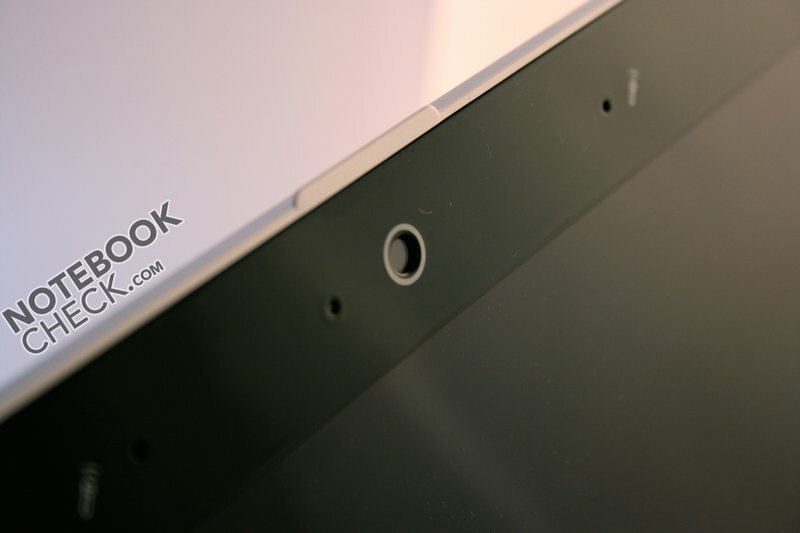 The 13.3 inch display couldn't really convince, with its reflective surface and a resolution of 1280x800 pixels. A CPU from AMD and a graphic from AMD takes care of the upcoming tasks in the Amilo SA3650. Especially the AMD CPU didn't really want to convince in the test. In comparison to Intel chips, AMD still stands in the back of the line. Because of the Puma chip set, which makes a connection to external graphic solutions possible, one's choice is restricted to Turion X2 CPUs, though. The system fan shows itself as always busy and provides for an always existent and well audible soundscape. Both of the integrated loudspeakers are found on the front side edge in the bottom area. 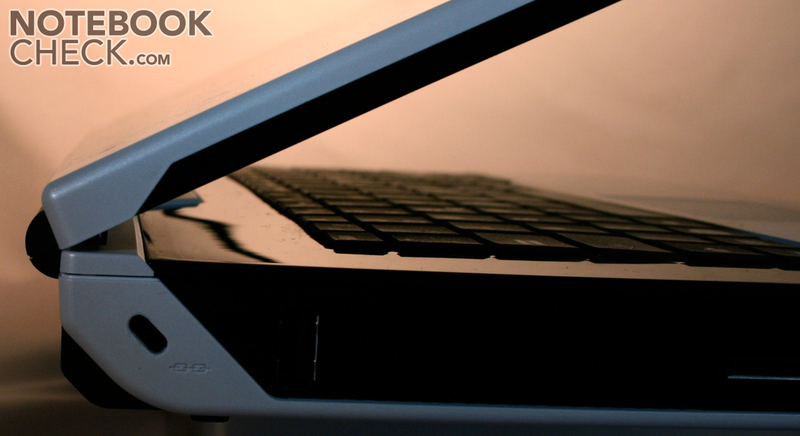 The keyboard built in to the device let itself be used well and showed a conceptional layout. Subnotebook or DTR? - The Amilo makes it possible to close these sheer insuperable abyss. The notebook shows the current Amilo design with a harsh black and white contrast and a very strict contours. Very important design elements are the 45° angles that remind of various science fiction classics. This impression is intensified through the use of high gloss surfaces, making a handling often problematic, though. This is particulary obvious on the touch sensitive extra keys where numerous unaesthetc fingerprints are quickly collected. 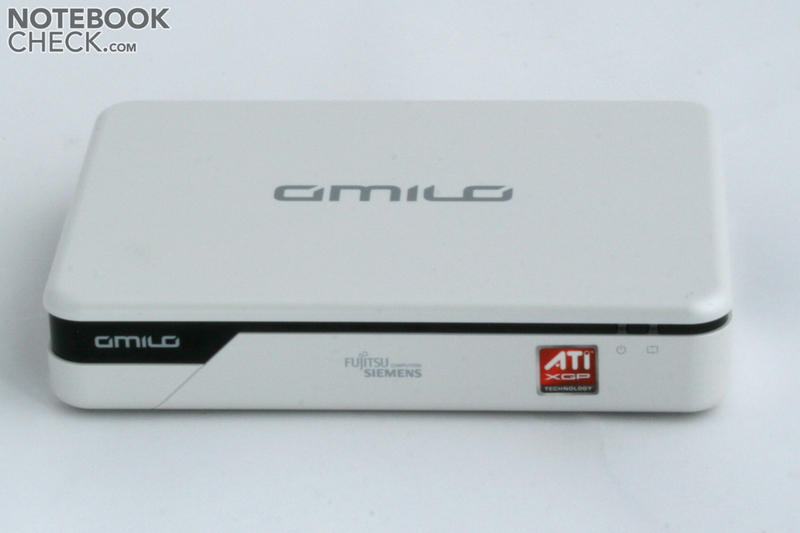 Unfortunately the case of the Amilo SA3650 showed some weak points in the test.. The plastic faceplate of the base unit which lets itself be lifted off of this without to much effort has to be criticized, too. 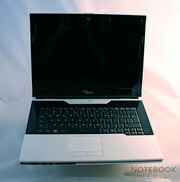 This is especially obvious in the area of the hinges as well as on the front side edge of the laptop. An absolute highlight is the Amilo Graphic Booster which provides the SA3650 notebook with abundant graphic performance. 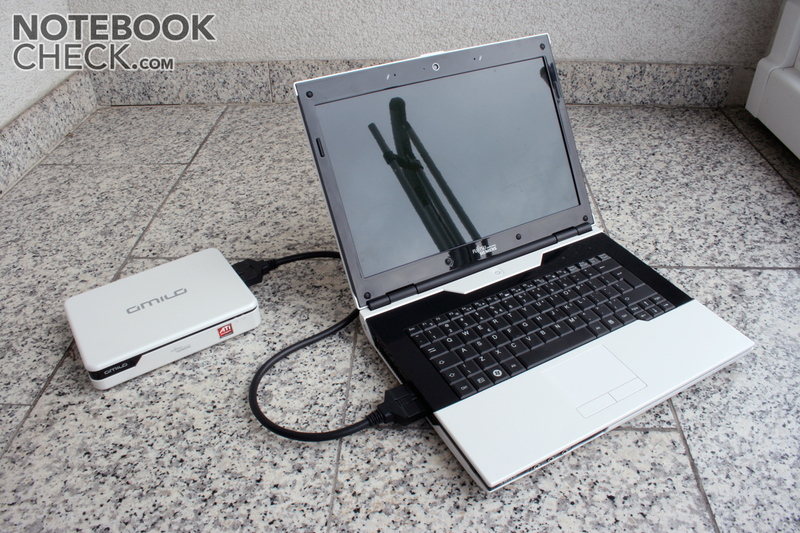 Connected over a special PCI-E port, the Amilo notebook can run up to 4 screens with the Graphic Booster. 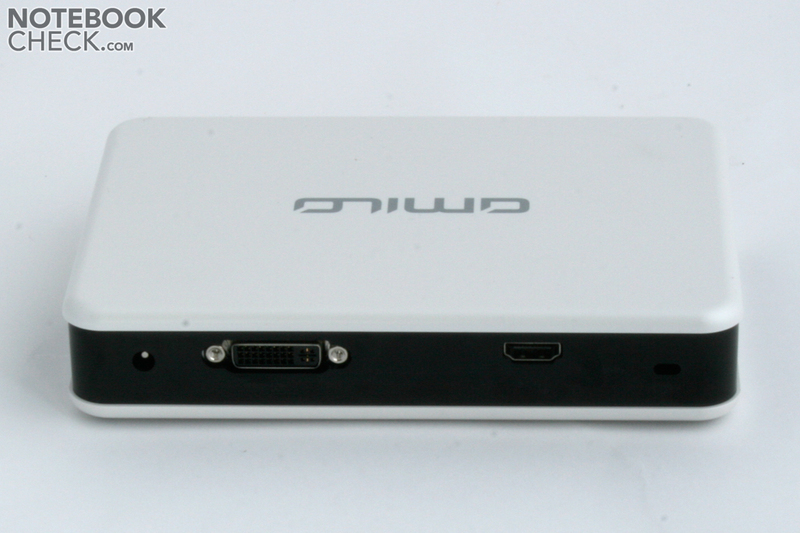 Besides an HDMI and a DVI-I port the Amilo Graphic Booster has two further USB ports to connect various devices, too. An ATI Mobility Radeon 3870 graphic card provides for proper performance in gaming use. Even though disadvantageously positioned, they can score with a very good sound. Besides that, the notebook offers the possibility to connect an external sound system via an S/PDIF port.